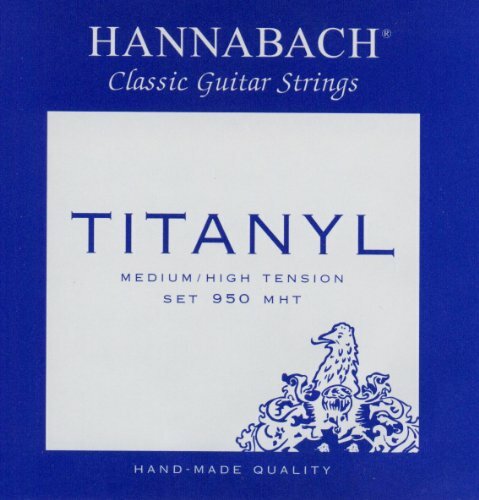 Set / Classical Guitar Medium High Tension Trebles: TITANYL(Titanium+Nylon) Basses: Silver-plated wound (LONGLIFE silver alloy) Series 950 Titanyl - strings developed for professional guitar players. The precisely round treble strings are made of TITANYL, a new polyamide mixture(thus the light grey colour). They have a clear, distinct sound, with open brilliance. The bass strings have a high-strength, flexible plastic core and are wound with a newly developed LONGLIFE silver alloy wire. The basses have a sonorous tone projection with beautiful, clear overtones. basses have a sonorous tone projection with beautiful, clear overtones. If you have any questions about this product by Hannabach, contact us by completing and submitting the form below. If you are looking for a specif part number, please include it with your message.